Single button plug/mode switch allows you to operate the universal adapter with one hand only. Your devices are completely safe due to the built-in security features such as safety shut-off and built-In fuse. The Dana BG travel adapter is patent-protected: ensuring its high effectiveness, safety, and reliability. No replaceable or mounted parts, the device is a compact and lightweight monoblock unit easily fitting into any suitcase or device bag. With two LED power indicators, you are able to find the power PLUG adapter and to plug / unplug devices even in complete darkness. The convenient carrying case is included FOR FREE, providing scratch/crack/dust protection. USB Wall Charger,FAST CHARGER,MAC CHARGER, Mobile Charger Wall plug charger is small, compact, lightweight. all in one charger, cellphone and tablet in one. dual usb travel charger. International adapter, Plug wall adapter, International SOCKET ADAPTER, PLUG ADAPTER, PLUG Wall. Thailand. ADAPTER UNIVERSAL! FAST CHARGING , Wall SOCKET PLUG adapter. This small all-in-one world outlet adapter fits your Italy, Europe, Sweden, etc. trips. It is protected by built-in fuse. ADAPTER is UNIVERSAL! 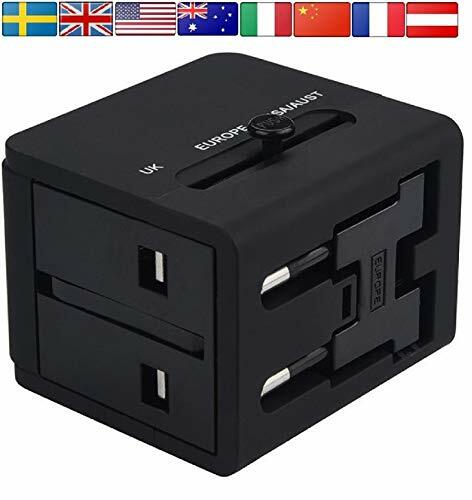 Universal worldwide charger for any devices like Samsung, iPhone, tablet, laptop or digital camera, Kindle in UK, US, EUROPE, Thailand, New Zealand, Italy, Rome, France, Spain, Canada, China, India etc. Amazing gift. This is not a power converter adapter combo, you have to check your device instruction. AC Power Rating: 6A max. 100-240Vac (660W max. at 110V, 1380W max. at 230V). 2.1A Single button plug switching mode. If you have any questions about this product by Dana BG, contact us by completing and submitting the form below. If you are looking for a specif part number, please include it with your message.